HD performance made highly affordable. 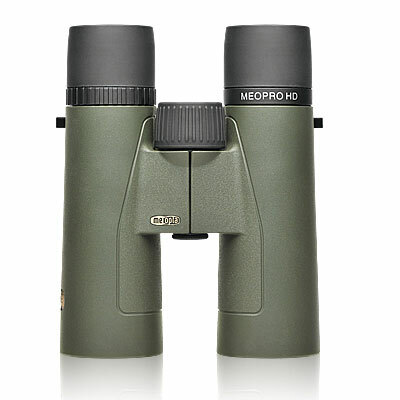 Perfect for any outdoor adventure, theAmerican assembled MeoPro® HD 42mm delivers the quality optics andHD performance rivaling binoculars costing hundreds more. Fluoride (HD)objective lenses eliminate chromatic aberrations (color fringing) and delivervivid, razor-sharp images withexceptional brightness. MeoBrightTM ion assisted lens multi-coatingsdeliver an outstanding 99.7% light transmission per lens surface whileMeoShieldTM coating protects exposed lens surfaces from abrasion.Ergonomically shaped rubber armor surrounds a rugged, lightweight magnesiumchassis for a comfortable carry in the field. 8x42– Wide field of view (384 ft.). Lower magnification offers increased depth offield and increased stability. Excellent choice for viewing nature in tightlyforest terrain and for following birds in flight. MeoBrightTM - A proprietary ion-assisted lens multi-coating applied to all air-to-glass optical surfaces. Developed by Meopta, MeoBrightTM ion- assisted multi-coatings eliminate glare and reflections and delivers an industry leading 99.8% light transmission per lens surface. HD Lens Elements - High-definition, extra-low dispersion, fluoride objective lens elements eliminate chromatic aberration (CA) or color fringing in challenging lighting conditions and deliver pin point resolution, increased contrast and vivid color fidelity. Focus and Diopter Control - Oversized central focus wheel delivers precise, accurate focus acquisition with no backlash. Right side diopter ring control is easy to adjust and accommodates +/- 3 D.
Chassis Construction - Magnesium alloy chassis is incredibly lightweight and extremely durable. Waterproof - All binoculars are 100% guaranteed waterproof, submersible and are fully protected against humidity, rain and snow. Fogproof - All binoculars are purged and sealed with inert Nitrogen gas to provide 100% guaranteed fogproof performance. Eyepieces - Eyepiece design reduces distortion and delivers a wide, sharp field of view. Multi-position twist-up eyecups accommodate all users. Protective Armor Design - Beautifully sculpted rubber armor is comfortable to hold for extended periods and protects internal components from shock. Lifetime Warranty - All binoculars carry Meopta’s North American Lifetime transferable Warranty.